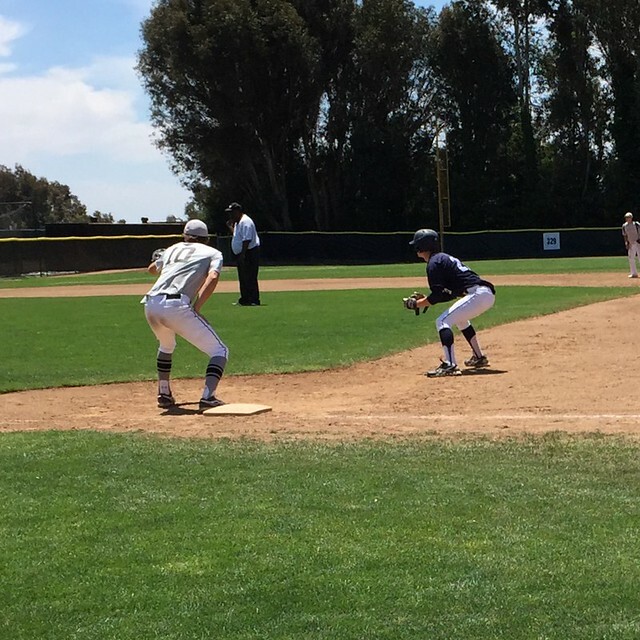 The Walbeck Elite will be playing in the Zoots Tournament over the next three or four days, including doubleheaders on both Saturday and Sunday. The Elite played Club All-Star in the first game on Saturday at College Park High School in Danville. At the plate, Jack was 0 for 2. In his first at-bat, Jack tried to bunt a 0 and 1 pitch for a hit. He bunted it too hard. The pitcher fielded it and threw him out at first. Jack struck out swinging on a 2 and 2 pitch in his second plate appearance. In the field, Jack played centerfield. He had two put-outs. Lee pitched a solid complete game. Unfortunately, the Elite gave up two unearned runs on three errors. Additionally, they couldn't string together any timely hits. The Elite lost the game by the score of 4 to 1. The scorebook is here. The Elite turned right around and played Kali White in the second game of the tournament. Trevor who played with Jack on the Jesuit freshman and JV baseball team was playing for Kali. At the plate, Jack was 2 for 3 with an RBI. In his first at-bat, Jack lined a 0 and 1 pitch into right field for a single to lead off the third. Unfortunately, the next three batters hit fly balls for outs and he ended the inning at first. With Trevor on first, Jack hit a 2 and 1 pitch for a hard grounder through the right side for a single in his second plate appearance. The next two batters hit fly balls for outs to strand Trevor and Jack on first and second. In his third at-bat with the bases loaded and one out, Jack grounded the first pitch to the shortstop. Freeman scored from third and Jack was thrown out at first. In the field, Jack played right field. He had two put-outs. Managing only five hits (two of the hits by Jack), the Elite lost the game by the score of 4 to 2. The scorebook is here. For the summer season, the Elite have a record of 2 win and 6 losses. The game log is here. The Elite will play AZ Zoots and Lamorinda on Sunday at CSUS East Bay.